A perpetual artwork streaming machine. Galeri turns your computer's background into an art exhibit. Think of Galeri as your own dutiful curator, quietly replacing your desktop background throughout the day with a steady stream of fresh artwork: regionally and globally sourced, prehistoric to modern, cage-free and organic, from museums and other archives around the world. 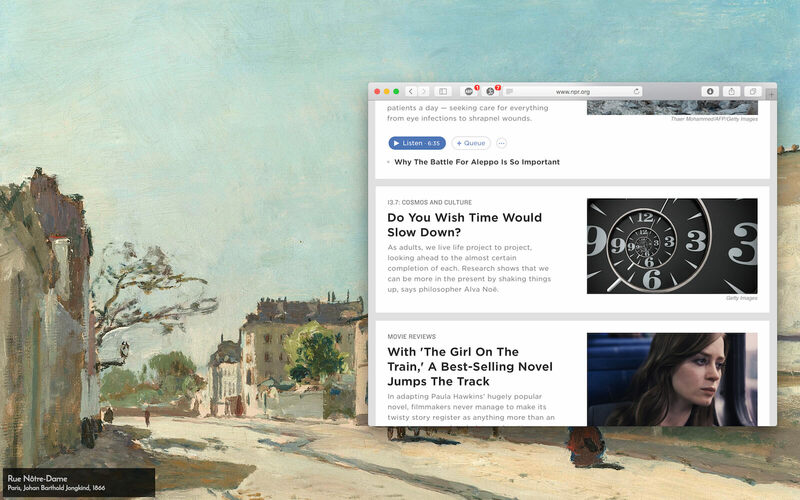 If you're looking for little inspirations throughout the day, want to learn more about art history, or are just bored with having to choose your computer's background, then you may like what you get when you give Galeri a shot. Galeri is in early Beta. We've only begun work on Galeri but would love for people to start trying it out! Let us know about new use cases (perhaps like hacking together a raspberry pi and a display mounted on an ornate frame to make an ever-changing painting?). We'd also love to hear about any of your ideas or issues on our Github. Galeri is (obviously) free, and always will be. It aims to follow the spirit of its sources by never putting up any sort of gateway or obstacle between you and something that should never be used for profit. We've engineered Galeri with performance in mind and designed it so that it'll never get in the way of your day to day. Let it hang out in the background and occasionally surprise you. Special thanks to Wikipedia, Rijksmuseum, The Metropolitan Museum of Art, The Guggenheim, and The Cooper Hewitt Museum of Design for providing the open material that make projects like this possible.